Along the Greenland ice cap, an expedition team makes an astounding discovery. Buried five hundred feet below the ice cap is the wreckage of an ancient ship—and nine perfectly preserved Vikings. Rune markings indicate it went missing in 1016 BC. Energized by the find, retired Air Force general Steven Macaulay assembles the foremost scholars of Norse archaeology, includingAlong the Greenland ice cap, an expedition team makes an astounding discovery. Buried five hundred feet below the ice cap is the wreckage of an ancient ship—and nine perfectly preserved Vikings. Rune markings indicate it went missing in 1016 BC. Energized by the find, retired Air Force general Steven Macaulay assembles the foremost scholars of Norse archaeology, including Harvard academic and master decoder Lexy Vaughan. But the mission is violently sabotaged—because this discovery holds the key to a mystery that will change the human race. To put together the pieces of the puzzle, Macaulay and Lexy plunge headlong into a web of chaos and betrayal—all the while hunted by a covert primeval society that will stop at nothing to protect their secrets. So, alles klar. Ich schmeiß den Lehrerberuf hin und werde Ärchäologin. Oder Runenforscherin. Oder Nordistikerin. Ist entschiedene Sache. Ein spannender Verschwörungsthriller mit wirklich sympathischen Charakteren. Die Wikinger waren auch mal ein etwas anderes Thema. Allerdings hat mir noch etwas gefällt damit mich das Buch wirklich fesselt. Insgesamt hat es mir aber gut gefallen und ich werde auch sicher den nächsten Teil lesen :-)Eine ausführliche Review findet ihr auf meinem Blog: Rezension: „Eisiges Runengrab“ von Robert J. Mrazek | Ani´s CrAzY Bookworldaniscrazybookworld.wordpress. A fun thriller that reminded me of James Rollins. Some situations were a little too out there, and some characters were absolutely unlikable, but the story flows so fast that it's hard to stop turning the pages. This one was pretty good all things considered. I was hoping for a bit more Viking involvement/lore. Instead, it ended up as another plot to take over the world. Seriously, think Hitler except with a Norse legend to support the effort. Some of the military details seem a bit off, and some of the events are simply too far fetched for me to visit this author again. But, it was a quick read and not a bad way to spend the time. This book was just OK. I liked the setting in Greenland and the part about the Vikings was interesting. However it was clearly written from a male perspective and for a male audience. I was a little bit tired of hearing the male characters think about the female characters as mainly just objects. 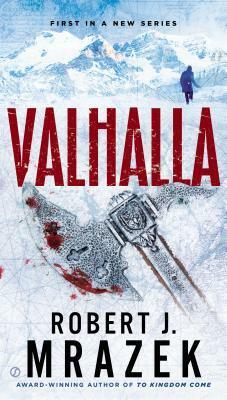 I read this one primarily because I was interested in Greenland and the Vikings. I will not be reading anymore in the series. Cliched writing. Predictable characters. one dimensional bad guys. lack of non-white characters except for an unnamed "Eurasian girl" flight attendant. Overuse of technical alphanumeric names of weapons, vehicles, etc. every woman described by level of beauty. Meh. Got weird and not in a good way. An extremely "meh" book. The plot and characters seemed cliche at some points. I expected the "monumental discovery" would actually be interesting; instead it was just a viking tomb that didn't have to much significance. I was disappointed. Bought this book for $2 at Half price Books for a trip. Enjoyed the short chapters and continuous action but not the dated view of women as sexual objects. The focus on Vikings was interesting but superficial. Still a good two buck read. My first read of a Fictional Mrazek novel and I enjoyed it . A Dawn Like Thunder and To Kingdom Come were excellent, and superior to Valhalla , but I will go forward with more of his fiction . A Viking thrillerwho'd have thought it? All I ask from quick-read genre books like this one is that they entertain me, and this one definitely did that. Another great book! Action, romance and history. I have never read a book by this author. I will look for some of his other books. Great read.